It’s hard not to get tea drunk when exploring tea in China. You can get “tea drunk”. Yes, you read that right, tea drunk. So the symptoms of being tea drunk include foggy thinking, nervousness and a stomach ache. Usually this is prevented by making sure one has eaten before drinking tea or by limiting the consumption of tea. Now a tea maker is going to have a tough time limiting tea consumption, especially during a harvest period, so timing breaks during the day with no tea consumption is critical. Also, some of the makers talked about the best time to taste tea being in the afternoon after lunch, when supposedly your taste buds and brain are functioning at their best. Novice tea drinkers should be served weaker tea. Knowing whether or not your guest is a routine tea drinker and their favorite types of teas influences how much tea you put in the pot. This was totally eye opening the first time we heard it. Indeed, in China it is very important to not overwhelm a guest with a flavor profile they might not understand or appreciate. 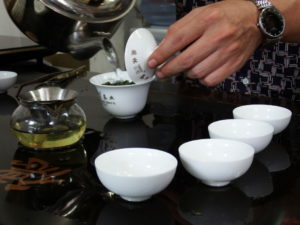 The tea can be cut by as much as half or just by a third for the first serving to watch the response of the guest and then increased to full intensity in subsequent servings. Tea is medicine. Tea, having been consumed for centuries in this country, is talked about as a cure for digestive issues, blood thinner and cholesterol remover, preventer of cold and flu, and general cure-all. Medical studies in both the East and West are slowly catching up with the cultural beliefs and beginning to prove or disprove many of them. However, this view of tea as medicine is reflective of the overall cultural belief that what you put in the body daily is critical to health. The big take away, not surprisingly, is that there is still much we can all learn and explore when it comes to tea. The history of the Silk Road and tea are intertwined in ways that still affect the tea we all drink today. So for a quick view into what the Silk Road did for tea, here are 5 facts about the Silk Road. 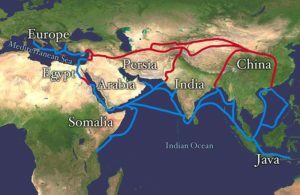 The Silk Road is not a single road but a series of routes that encouraged trade in many goods, including tea, as well as the exchange of knowledge and cultural habits. Many of these routes existed independently before being brought together into a contiguous network of roads during the Han Dynasty (206BCE-220CE). These routes exposed various cultures and supported a lively trade in goods and exchange of knowledge. The Chinese not only gave Westerners knowledge of paper, gunpowder and silk, but received back knowledge of many western religions and irrigation for agriculture and live stock. The Tea Horse Road was the route through Yunnan that brought tea to the rest of China and to the West. This road is very treacherous with narrow roads that snake along the side of mountains that easily washed out and were barely wide enough for a horse or human on foot. This route gave birth to what we now call Puerh. Moroccan Mint was created on the Silk Road. The exchange of spices was common on the Silk Road. Mint was grown by the Romans, Greeks, Egyptians and exchanged for many things including tea. During the height of trade on the Silk Road, tea was sold in crushed bricks and prepared with many spices including mint. Goods and people didn’t just leave China for what is now the Middle East and Europe. Many people and their cultures came into China and stayed. Along the old Silk Road in China is a hugely diverse population that include Yi, Bai, Hani, Zhuang, Dai and Mao. These ethnic groups have different languages, dress, religious beliefs and holidays. While the People’s Republic of China officially recognizes these categories, many of these categories, like the Yi group together another 30-40 ethnic groups. These ethnic minorities are many of the skilled tea workers, not just in the fields but in the manufacturing of tea in Yunnan. For some, like the Yi, their holidays are based around the tea harvests. One Belt One Road is China’s current plan to rebuild the Silk Road by investing in infrastructure not just in China but into the Middle East and Europe. While it is presented as a way for China to expand its international influence, it ignores how China will be influenced by those countries who choose to participate. Trade is a two way exchange when done successfully, so if the Chinese government really wants this to be successful they will have to bend and be open to the influence and culture of the other countries, which could have some unexpected outcomes for them. This will be an interesting project to watch. Before you even pick up the ingredients it is critical to build your steamer. Now if you are used to using a bamboo rice steamer and your cake pan fits in it, go ahead and use that. For those of us that don’t have a bamboo steamer, we need to do some simple construction to build one. First make sure your cake pan fits nicely inside your large pan that has a tight lid, you need to have at least an inch of room above the cake pan when you set it in the bottom. 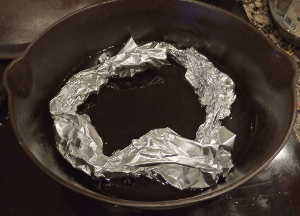 If the lid is not tight, you will need to adjust your cooking time up to compensate for losing steam from the pan. Second, tear off 2 pieces of aluminium foil about the length of your forearm and shape them into snakes. If you are opting for the bread loaf pans, you may need 3 pieces. Do not crush them flat, you are building a platform to put your cake pan on so it does not sit in the boiling water. Shape the snakes into S or C and place into the bottom of the pan and put your cake pan on top. Adjust the height of the snakes so that the lid still fits over without touching the cake pan. 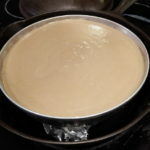 Try your best to make them level otherwise you will find that your cake may come out thicker on side versus the other. Once you know everything fits, spray your pan and place it on your snakes. Start up your kettle full of water, you will use this water to fill up the pan at the appropriate time. 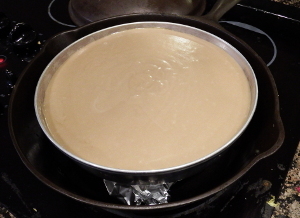 Take out the second pan and put in the 2 cups of water and dark brown sugar. Place it on a burner set to high and start stirring. The goal is to melt the sugar without allowing the water to come to a boil, so you cannot walk away. It will only take about 5 minutes for the water to steam and for you to no longer have sugar crystals along the side of the pan. Remember, do not let it boil. 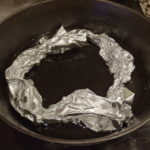 Once you know you are sugar crystal free, take the pan off the burner and put aside. Put all the rice flour into the bowl of your stand mixer and slowly pour in the hot water. Set the mixer to low until all the water is in and then put it on medium. Once the water looks incorporated, stop the mixer and scrape the sides and bottom and start it again. Put in the almond extract and mix for a couple of minutes and then stop. While your electric mixer is going, pour water out of the kettle into your steamer set-up. Take out the cake pan so you do not get it wet. You want enough water to come up about 3/4 of your snakes. Go ahead and turn on the burn the pan is sitting on. Since you already have warm water, set the burner to low. We want a simmering boil while the cake steams, not a rolling boil. Put the cake pan on your snakes and pour in the batter from your mixer bowl. 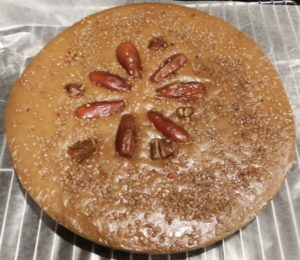 Sprinkle the toasted almonds and arrange the dates on top of the cake. Put the lid on the pan and allow to cook for 60 minutes. You should check the pan and possibly refill the water at the 25 minute mark. You will probably not need to refill the water if you have a tight fitting lid. If your lid is not tight fitting, plan on checking every 15 minutes. Remember we do not need the water at a rolling bubbling, just a gentle simmer. When an inserted tooth pick comes out clean, the cake is done. Turn off the burner, and transfer the cake to your cooling rack. It needs to cool completely, which can take upwards of 3 hours. If you try to slice it sooner, it is a sticky mess. 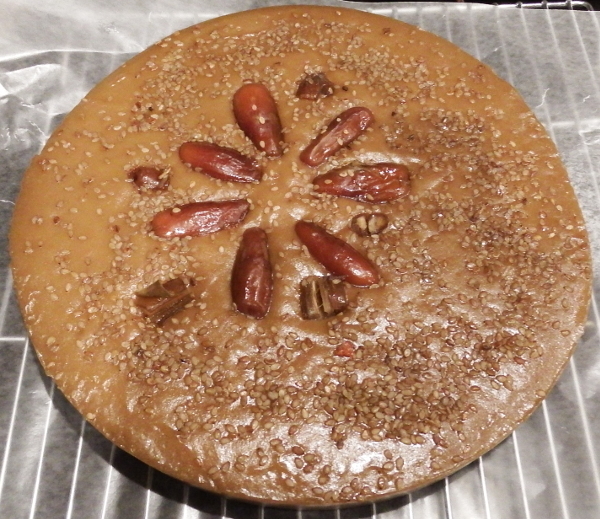 The cake can be cooled in the refrigerator. To serve, slice the cake into thin pieces and rewarm in the microwave for 30 seconds so they are not rock hard. You can also fry them in a little sesame oil. Puerh Cakes and Bricks available at our Purcellville, Virginia tasting room just outside Washington, DC. Here are 5 different teas worth trying in the new year if you haven’t had them before. Why should trying new teas make it onto your goals list? Very simply, it will teach you more about yourself and your tastes than you give the simple cup of tea credit in doing each day. New taste experiences, even if they are unpleasant, help you understand which flavors and mouth feels you like better and helps you appreciate your favorite teas even more. So now on to those teas. Puerh – This daily tea in China is not drunk as often in the United States. Puerh (a.k.a. 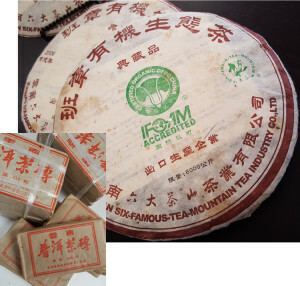 pu-erh) is a fermented tea that comes in two forms: ripe (black tea) and raw (green/white tea). 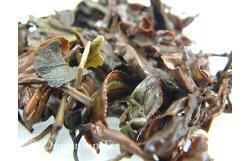 This earthy and vegetal tea is an experience that may open up a whole new world of tea for you. Here are a few more posts to learn about puerh in case you are curious and need more convincing: Intro to Dark Tea and Raw versus Ripe Puerh. Bai Hao Silver Needle – This simple and elegant white tea is often over looked because it has a very delicate smell and brew color. But don’t let its simplicity fool you. This first flush tea is made from the bud of the tea plant and is prized for the silver hairs that grow on the outside as a protection mechanism for the plant (bugs have a hard time chewing through the hairs much less standing on them as they try to eat). Kukicha – This Japanese tea is made from the stem of the tea plant. It produces a light creamy brew that is slightly salty. It doesn’t have the history of our previous two picks, but if you are a fan of efficiency and using every part this could be your new favorite tea. Oriental Beauty is just one of many different teas to try in the new year (shown here after infusion). Oriental Beauty – This beautifully complex oolong from Taiwan is created with the help of green leaf hoppers. The tea leaves are harvested after green leaf hoppers pass through the tea fields and munch on the tea plants, which causes the plant to produce additional polyphenols. These polyphenols give the tea a smooth mouth feel and a complex flavor. Enjoy the new year with 5 different teas and learn more about your favorite beverage and yourself at the same time. Are there Thanksgiving traditions in Asian Countries? Thanksgiving is thought of as a true American holiday that started with the Pilgrims celebrating a bountiful harvest with the Wampanoag Indians in 1621. The celebration of the fall harvest is not something new and could easily be found in other countries. 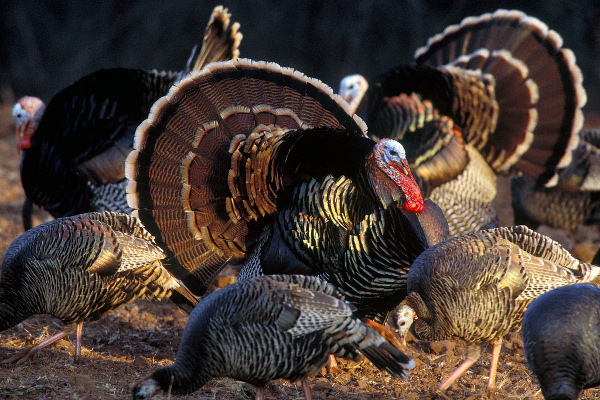 So let’s look at the Thanksgiving traditions in some of our favorite tea growing countries. China does not have a holiday that corresponds to the US Thanksgiving. They do have a Mid-Autumn festival that has been around for about 3,000 years that celebrates the first full autumn moon, which happens to correspond with the fall harvest of crops. The Mid-Autumn Festival does includes big dinners with family, but those are the norm for most of the important Chinese holidays. The food of choice for this festival is mooncakes. Not to be confused with the American Moon Pie cookie, mooncakes are a small pastry with a dense filling. There are different fillings and flavors based on the region of China that you live in. They are always served with tea. So we will save a more in depth discussion on mooncakes for a later blog. The Chinese government does recognize American holidays and encourages local businesses to make turkey available around the American holiday where there are larger numbers of American’s are living in China. Currently there are believed to about 100k Americans with green cards living and working in China (The US government does not count US citizens who live aboard that are not associated with the US military or diplomatic operations, it is done by other organizations). The Vietnamese, much like the Chinese, have a Mid-Autumn festival that celebrates the moon and the fall harvest of crops. Many of the Vietnam holidays follow the Chinese, so this isn’t a surprise. However, Vietnam has a large and growing American tourist trade, so finding an American Thanksgiving dinner with turkey and cranberry sauce is a little easier. You just have to book reservations about a month or two in advance in Hanoi at some of the higher end restaurants to get your turkey dinner with cranberry sauce and stuffing. 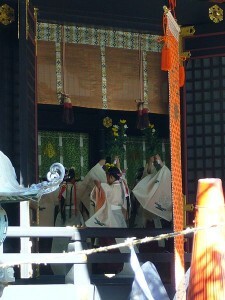 Niiname-sai,traditional Japanese dance by Wikimedia user katorisi. Japan has a formal Thanksgiving holiday on November 23rd every year. It is called Labor Thanksgiving and was introduced into the country after World War II during the U.S. occupation. The Japanese put their own twist on it by using the holiday to honor each others’ work through out the year. Labor unions use the day to hold festivals focused on human rights, peace and the environment. Labor Thanksgiving was combined with the ancient celebration of the fall harvest of rice, Niinamesai. It is documented that Niinamesai was first celebrated in 678 C.E. During Niinamesai, the Emperor presents the first harvest of rice to the Gods and partakes of the rice himself.